This is a relatively easy walk, but good fun. It takes you off the beaten track, so requires some confidence. It is categorised as Difficulty 2, as there is some easy scrambling both on the way up and on the summit ridge, and a short line may be found useful for inexperienced members of the party. It takes the standard route up to the Cabane du Bachasson, but then follows the path around to the south before finding a way through the cliffs onto the south-east ridge. There is ample parking on the road at the col de Porte (1320 m, grid ref. UTM 31T 71699 50189), or alternatively, you can park on the track leading to the piste. The ascent traverses a fair amount of ground, but it is easy and pleasant (map). Follow the track to the piste area. Immediately after passing a low building on the right, take the next track (under 10 minutes from the car) leading into the forest on the left. This ascends gradually to the north, until returning to the south. At the end of the track (1547 m) a footpath ascends to the north before returning, and emerging out of the forest into pasture. This leads to a cabin, the Cabane du Bachasson, and a water source (1635 m), some 40 minutes after leaving the car. We now leave the crowds behind. From here take the path below the cabin, that traverses towards the south through the forest. Some ten minutes later a flimsy fence is crossed, and the path divides. Keep to the left, and you soon leave the forest, and start climbing. Soon after, you will see an arch in the cliff ahead. Climb up towards this and then traverse back under the cliff where 30 metres back there is a gully providing a way through the cliff - the Pas de l'Arche. Clamber up this (Difficulty 2), to find a cairned path leading to an easy rake. A further cairned route at the top leads to a path under some cliffs. Follow this to the east until there is a sizeable cairn. This marks the Rampe des Écureuils - a rocky ramp which provides an easy scramble to the top of the cliff. If you miss the cairn, you will find yourself at an impasse overlooking a large drop - just return for 50 metres. Once up the rake you are on safe ground - simply make your way up towards the crest to the half-right, and follow the ridge up towards the summit. 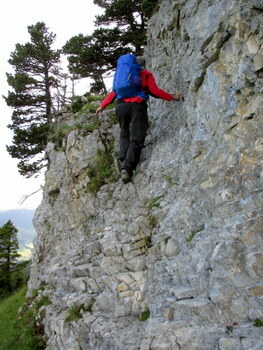 On the way up, you will pass a cable-assisted ascent up a gully - the Brèche Paul-Arnoud. Shortly after this, you will meet the main ascent path. Access to the summit is gained by an easy cable-assisted ascent (Difficulty 2) up a 10 metre chimney. There is no mistaking the summit ridge - it plummets on the eastern side by a couple of hundred metres. As usual, the views are superb, with the cliffs of Dent de Crolles and the Grand Som being particularly impressive. You need to be a little careful of fast-flying swifts and low-flying gliders, It is a good spot for lunch, which you will inevitably have to share with the alpine choughs. The best way down is to return the way you came up to a couple of hundred metres beyond the Brèche Paul-Arnoud where the path leaves the ridge and starts to drop down the flank to meet the voie normale at the bottom, thus avoiding a lot of scree as well as the crowds. This area of pasture has a particularly fine display of martagon lily in the early summer. The path then returns north reaching a huge boulder, la Folatière, some 40 minutes after leaving the summit. The Cabane de Bachasson is reached in a further 10 minutes. You now reverse the ascent and arrive back at the car within 90 minutes of leaving the summit, after a very pleasant and easy walk.